West Virginia decided to greet us with a snow storm. It was dark and it was snowing quite a bit. You couldn’t see the lines on the road. You couldn’t really see the road itself. Had it only been dark and not snowing or had it been snowing but in the daytime, there wouldn’t have been any problem. We were creeping along at 30 miles an hour. I envisioned us needing to pull to side of the road trying to keep the tired babies warm and then getting slammed into by another car that lost control. Never underestimate the ominous feeling of an intuitive woman (or me 😉 ). I spotted a sign for a Sleep Inn in 8 miles. My husband reluctantly stopped at the hotel. We weren’t making good time so there was no need to put our lives in danger braving the elements. At the hotel we decided that the ladies and kids would stay in one room and the fellas and the cold medicine would stay in another room. This way the guys will be sure to get the sleep that they needed to drive in the morning and we could get our tired babies a good night’s sleep in the pack-n-plays versus the car seats. Adaline would not sleep in her pack-n-play. I had to put her in bed with me (something I’ve never done before). She wouldn’t lie next to me, but rather slept on my chest the whole night. I did not sleep at all because aside from the fact that I was afraid to fall asleep and either crush my daughter or send her rolling off of the bed, I was also kept awake by a freight train driving right through the room my mom snoring and hungry screaming pterodactyls my nephew waking up crying every 45 minutes (*sweet dreams, Jenn*). Nonetheless I wasn’t too concerned about myself and rather just wanted my precious daughter to get a good night’s sleep so that she’d be more pleasant for the rest of the drive in the morning. On Friday before we left on the trip I thought that Adaline felt a tad warm. In the van I thought she felt even warmer but figured it might just be from all of the screaming and crying she was doing. In the morning she felt just as warm if not warmer and after making all of the other adults touch her forehead we agreed that she had a fever. Naturally I had no thermometer to confirm this and no infant medicine to administer to her anyway. The poor darling girl screamed and cried and fussed most of the day. She didn’t want her bottle, although she drank it from time to time. She was miserable and she wanted me to hold her. Of course I could not because she needed to stay strapped in. Finally we were able to get some infant medicine at one of the convenient stores. Now I could give her medicine to break her fever and she’ll feel better much better for the rest of the trip. This irritating toy kept Adaline quiet for a short time while Cool Daddy was trying to get some rest. I put the medicine in…and it came right back out. Adaline threw up for the very first time in her life in a van in a parking lot of some random rest stop. She had it all over her sleeper, on me, and on her cousin Dominic’s Glow Worm. I wasn’t going to try to give it to her again. She was nearly hysterical while crying and grasping onto me for dear life. Somehow I managed to get her cleaned up and back into her car seat. It wasn’t pretty, but we made it to Orlando after 10pm on Saturday night. Once we could get settled into the vacation villa and get Adaline some medicine and some regular sleep in her pack-n-play she’ll be back to normal. Posted on January 24, 2011, in Humor and tagged Florida, humor, traveling, vacation. Bookmark the permalink. 8 Comments. We track all of the baby daily deals in real-time. Would love for you to stop by and follow back! Thank you for stopping by Kitchen and Kids earlier. My goodness this sounds like some road trip. I remember a similar trip we took from Texas to Iowa when my son was 11 months old, the difference being – I knew he was sick when we left. I felt so bad for him. 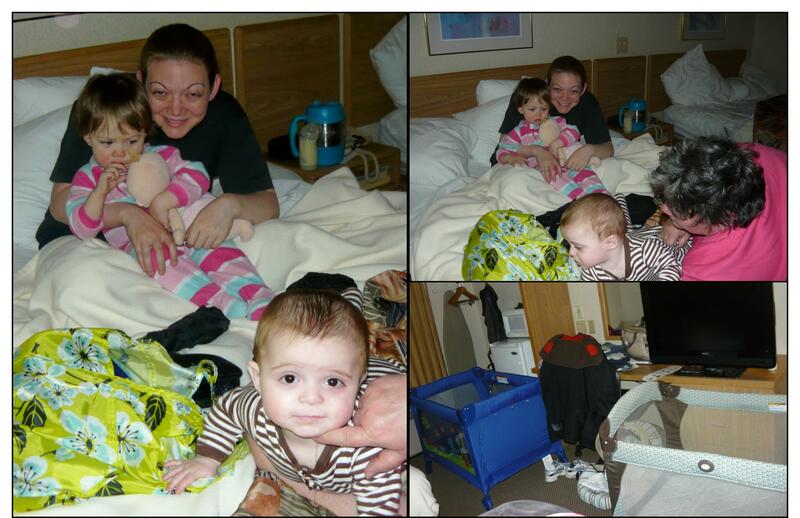 I hope Adaline got to feeling better, there is no fun in visiting family with a sick baby. BTW, do you ever call her Addy? I have an Addy Layne, which sometime comes out Addylyne, when I am Texas speed talking. Have a blessed week, and I can’t wait to hear the rest of your road trip story. It was quite the trip. You just feel so bad for sick little ones…and not being able to hold them in the care is even worse 😦 Adaline is all better now! Oh my, not fun, hoping this is the ‘dark second act’ and that things got better for you soon!!! I am so enjoying the trip you and your family went on…your a great writer….I can’t wait for more!! I’m so glad that other people are enjoying my story…especially since I didn’t appreciate it at the time.